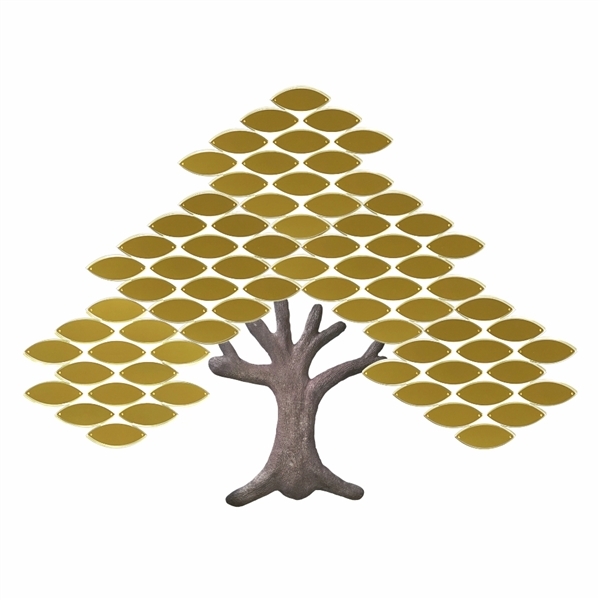 Leaf Size - 1-1/2" x 4"
One of our most affordable trees, the “Expanding Modular” Tree is a popular choice for ongoing fundraising campaigns or memorial trees, where you need the flexibility to add more leaves in the future. Leaves are attached to clear acrylic modules, where only 2 module configurations (A & B) can produce up to 9 different unique and beautiful tree variations....... Grow as go! Simply add future modules as you need to create a memorable and stunning recognition display. All trees are expandable! Expanding Modular trees are made from the highest quality materials. Each tree trunk is three dimensional, and cast from resin with impregnated bronze particles infused throughout. It's made to simulate a cast bronze trunk. Trunks measures measure approximately 14" x 16-1/2" . Leaves measure 1-1/2" x 4", and come standard in laser engraved polymer material with the following finishes: brushed gold, brushed silver, brushed copper, brushed bronze and green verde. For an added charge, change to UV printed metal leaves with the following available finishes: satin gold brass, satin silver brass, or satin copper. Leaves attach to clear acrylic module back panels. Each module is either an "A" module with 14 leaves or a "B" module with 15 leaves. All modules have polished edges and tapped holes to accept brass leaf mounting screws. Installation is a snap with our “easystall” mounting templates. All mounting hardware is included. When ordering, be sure to e-mail us all necessary copy for the leaves. Please note that published prices do not include leaf engraving charges. Please refer to Leaf Imprinting Price Schedule above for these additional charges. Please mail or e-mail us all copy for leaves. The over the phone customer service was very helpful. Unfortunately, the day we received the tree and began to install it, there was no silicon in the packaging. The installation video said it would be included.